The Gannet’s progress has been slow, but deliberate. When we left off, I said I was going to open the boarding ladder, which Sword outlines quite nicely on the right side of the fuselage. I almost considered not cutting it out, because it impinged on the nose wheel well, but I then realized I could simply put a piece of .005 styrene over the right upper wall of the well and it would be just fine. Of course, I then had to cut a slit in the side of the model that was 7/10ths of an inch long and 1/32 of an inch wide. As I did with the radar observer’s compartment doors, I chain drilled the ladder opening. The difference here was I had to drill every one of the holes in a near-perfect line. My fear was that I’d end up with an overly-wide opening, which would have looked cartoonish. Instead, when I cleaned up the opening with a No. 11 blade and some sandpaper, it looked just fine. The .005 styrene was added and the bay was airbrushed red; the interior of the wheel bay was painted gray. Mission accomplished! And, just like that, the back of the ladder compartment is closed, with .005 styrene. A little red paint finished off the ladder compartment. Next, I opened up all the intakes in the nose. There are six of them – and the nose piece is very, very thick. The lower intakes are perfectly round, so it was a simple matter of drilling them out. Photos showed these intakes had screens inside of them; I struggled to find the right parts to replicate this until I stumbled across some 1:700 modern destroyer helicopter deck safety nets, which were perfect solutions. The main intakes took a lot of work with a motor tool to open up, followed by plenty of careful cleanup with a No.11 blade and sandpaper. Getting the shapes of the openings the same was critical; that meant the first intake went really easily and the second one took a half hour to match up. The same went for the upper intakes. Oh, cutting this open was fun. Now I had to start thinking strategically. This model was going to be a tail-sitter for sure with the resin radar observer’s position well back of the main gear. To offset that, I added some pieces of thick styrene strip to the top of the nose wheel bay to function as a dam of sorts, then loaded in about 14 grams of split shot lead fishing weights, all secured with white glue. Another piece of styrene blocked it all in place. Then, I made the turbine faces for the Double Mamba engine. This was fairly simple. First, I made a backing plate that fit the fuselage; this would go right against the styrene strip at the front of the weight dam. Next, I added two quarter-inch sections of 7/32nds styrene tubing, gluing in place so that they were directly behind the inside walls of the intakes in relation to the nose piece. Turbine detail was added with half-round styrene strip; after it was glued into place, the excess was trimmed away. Simple but effective (and completed in less than an hour at the Fremont Hornets’ buildfest). I painted this black, in keeping with photos, and lightly drybrushed my turbine blades. The goal here was not to replicate the entirety of the duct but to give a suggestion of something inside the nose, and this worked well. Next, I joined the fuselage halves. The fit was not great, but I worked in sections to close it up. Sanding took a toll on some detail; most of it I could rescribe with my UM scribing tool, but the big reinforcement bands on the fuselage had to be replaced with strips of .005 styrene. Some small antenna detail was lost on the bottom, but this could be replaced during final construction. All closed up and (mostly) rescribed. Note the two white strips – detail lost in sanding was replaced with .005 styrene strips. Then, I added the turbine section. It fit neatly, and it blanked off the nose weight just behind it. Peek a boo! The turbine section in its new home. I painted the nose piece sky; this way, after it was added, I wouldn’t have to mask the black turbine section inside it during final painting. It also presented somewhat of a sloppy fit. It went on, but I had to do some significant sanding to get rid of seams and steps. That was followed by some tough rescribing of the fasteners on the nose, which I accomplished with Dymo tape and an old Verlinden scribing template. The rest of the nose detail was also added back in. Whew! I now have a heavy but completely rescribed fuselage that’s ready for its wings. I’m going to pause, however, to work on another great 1950s design, the F-106 Delta Dart. More from the Gannet when the Delta Dart reaches the same stage the as this build! The Fairey Gannet came in a number of variants – the AS.1 and AS.4 anti-submarine warfare platforms, the T.2 and T.5 trainer modifications, and the COD.4 trash-hauler – but if any version could be said to be the most attractive Gannet, it was the AEW.3. This is truly damning with faint praise; with its bulging radome and finlet-bedecked empennage, plus its decidedly un-aerodynamic collection of antennas, scoops and other protrusions, the AEW.3 was an odd-looking machine by any standard. Nearly everything about the Gannet AEW.3 was different from the AS.1: the exhaust was relocated, the fuselage lost its additional seats behind the cockpit and instead housed two radar observers in a compartment submerged in the redesigned fuselage; the shape of the vertical fin was changed to offset the loss of directional stability caused by the omission of the long canopy. The landing gear was lengthened by three feet to give the radome deck clearance. The plane differed so much from the original Gannet that there was talk of renaming it the Albatross, but the Royal Navy’s retirement of the anti-submarine Gannets around the time the AEW.3 made its fleet debut in 1959 limited the possible confusion. Built to replace the Skyraider AEW.1 (an AD-4W in U.S. Navy parlance), the Gannet AEW.3 used the same electronics – the AN/APS-20 radar system. It was intended as a stop-gap measure until a British purpose-built aircraft incorporating the latest in electronics could be built for the CVA-01 class of aircraft carriers. Unfortunately, the Defense White Paper of 1966 – the same document that cancelled the TSR.2 – put an end to Britain’s plans for a large carrier for almost 50 years, and it meant that the AEW.3 would have to soldier on with no replacement in sight. They operated right up until the last carrier they could fly from, Ark Royal, was retired in 1972, and then from land bases until 1978. In the end their two biggest enemies were attrition – 22 of the 44 built were lost to accidents – and the Shackleton program. Numerous Gannets lost their radars to Shackleton MR.2s, which rendered the Gannet airframes expendable. Only seven AEW.3s survive, with six in museums and one undergoing restoration to flight. Sword’s box captures the AEW.3 in all its graceful glory. I’m building Sword’s new Gannet AEW.3 kit in 1:72 scale. 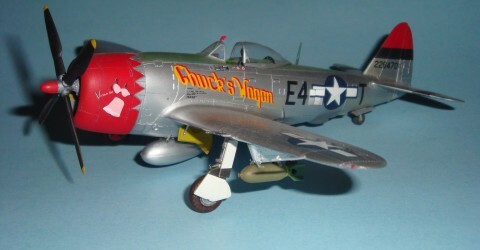 The model features a lot of surface detail, as did the real plane; it also has a small sheet of photoetched parts, but no resin. The plastic parts for the wheel wells are somewhat under-detailed, and the cockpit sidewalls are mere abstractions of what’s actually there. That said, they give you a structural place to start. Sword also sells a resin set for the radar observers’ position. (Read Mark Davies’ very good review of it here.) I’d seen an AD-4W at the IPMS/USA Nationals one year with the radar operators’ compartment opened and always wanted to do something like that, so here was my chance! Step one was the seat. The kit gives you the seat itself and the arm rests as separate plastic pieces. The arm rest part will become weak and break if you cut it from the sprue with flush cutters – use a razor saw instead. I airbrushed the seat and armrest with Testors’ aircraft interior black (I sprayed the instrument panel, sidewalls and cockpit floor and rear bulkhead at the same time), then dry-brushed with gull gray and finally a little aluminum to suggest chipping. The headrest on the rear bulkhead and armrests were brush-painted with Testors leather. Gannet seat, before addition of the sidewalls. I brushed a little Future on the seat back and added a tiny white stencil decal to duplicate photos. This was a bit of a wasted effort, since the shoulder straps almost completely covered the stencil! The whole mess was shot with Dullcote and allowed to dry. One item missing from the kit seat was the seat cushion/survival pack, which was very apparent in photos of XL500. I made my own from a bit of shaped .040 by .030 styrene strip, with the notch carefully carved and then sanded. The cushion was painted yellow, then masked and painted sage green on the seat area. The edges of the green area were them masked and sprayed green. The resulting product was dirtied up with some pastel powder and glued to the seat pan. Based on eye-witness accounts of Gannet AEW.3 XL500’s interior, the lap belts were painted gray while the shoulder straps were painted metallic blue. The kit’s lap belts went together well and were placed on the seat pan, with the buckle ends glued to the pan and then the fastener ends carefully folded over the seat edges. The shoulder straps were supposed to wrap around a photoetched bracket that attached to the rear bulkhead, but the bracket allowed almost no contact area for glue. Instead, I folded the bracket, wrapped the ends of the straps around it, glued the bracket in place, attached the straps to the seat back and glued the bracket to the bulkhead, allowing the straps to support it. I had to trim about a quarter-inch from each strap to achieve the correct length. The photoetched instrument panel was dry-brushed and the acetate instrument faces were added to the back with Future as the adhesive. The panel comes in three sections, which were CA-glued to the plastic instrument panel backing provided in the kit. The AEW.3 instrument panel had its six primary flight instruments (airspeed indicator, attitude indicator, altimeter, vertical speed indicator, heading indicator, turn coordinator) outlined in white. I cut extremely thin bits of white decal and carefully place them where they needed to go, getting a good result for the scale of the instrument panel! The sidewalls were detailed, first with the kit’s photoetched parts, then with additional details fashioned from styrene rod, Reheat photoetched switch panels, and bits of wire. The whole mess was painted, dry-brushed and then details were picked out in gray, white and red with a fine brush. Sidewalls, dressed up with some details prior to painting. Next, I put the sidewalls in place and used a razor saw to remove the rudder pedals from the sprue. These were cleaned up, glued in place and painted, then dry-brushed. Now, with the exception of the control column and some handles, the cockpit’s ready to stick in the fuselage. The cockpit with the side consoles and the rudder pedals in place. But there was one more cockpit to work on – the radar observers’ compartment. I used my motor tool and a fairly large bit to chain-drill the hatches; once I could pop out the plastic, the edges were dressed with some carving with a sharp No. 11 blade. I also carved back the interior of the hatch for a more scale thickness. The openings were then sanded with some microfiles, followed by sandpaper. The sandpaper was also used on the interior to even the interior walls out. …And careful use of files, carving with an No. 11 blade and sanding cleans up the opened hatch. This Sword set is all resin; it gives you no color call-outs or seat belts for the observers’ seats. Thus, my first stop was the internet, where I found photos of the interior from a museum example. The basic color was British interior gray-green; I airbrushed the parts black first, then sprayed gray green. The various boxes were then painted with a mix of dark gray colors, each one being a little different. The whole mess was given a dark wash, then dry-brushed. Radar scopes, instrument dials and other details were picked out in gray or white. After a spray of Dullcote, any dials received a drop of Future for shine. Rear and front bulkheads for the radar observer’s compartment. The seats were painted and weathered, then gained seat belts sourced from an old Airwaves set, with quick-release fillings pillaged from an Eduard set. Seats! Note the weathering to the floor. Sword neglects to provide any color call-outs, so I recommend the images that begin here as a good starting place. The many exposed wire and cable runs are next. Next time: extra details, closing the fuselage, and adding a lot of nose weight! Stay tuned!